This is written to you out of concern for the conditions that my Father, Dr. Dale Howard Kewitz Sr. is being kept in: he is being held under lock down at a locked “memory care” facility and his Guardian, Jonene Eisch has left a Restraining Order at the facility dictating that none of my siblings or I even have telephone contact with my dear Father. The facility is Inspired Living at Hidden Lakes in Bradenton. Neither Ms. Jonene Eisch nor her attorney, Rebecca Proctor, followed due process or behaved in good faith when they submitted the Petition to have my Father declared Incompetent: They did not even try to contact me or give me any notice or opportunity to be there for my Father. When I did a Google search of Ms. Eisch to find out who she was, I was horrified to see her name come up in several documented Inspector General reports and other reports of “Toxic Guardian Abuse” by Ms. Eisch and others associated with Ms. Eisch in Bradenton County. In fact, the very day that I called and did speak the one time with Ms. Eisch I told her that I was aware of her sordid history of duplicity and abuse and that I wanted to become my Father’s Guardian, as my Father and I have always enjoyed a good relationship and no stranger could love him or care about him more than I. Ms. Eisch immediately agreed, but I’ve since learned that after our conversation she immediately left a “No Contact” Order with the Director of Inspired Living at Hidden Lakes, prohibiting contact with his children. Your Honor, what is absolutely shocking and terrifying to me is that complete fabrications and lies are now being manufactured in a hoax that the colluding Director of the care entity, Twila Young is mendaciously engaging in. I’d heard of these highly abusive tactics from other cases, including the Al Katz case, but was nonetheless stunned when I last tried to call my Father again. Out of the blue, Ms. Young angrily hurled abuse and insane lies at me when I simply asked to speak with my Father. “Your Father is upset. Your Sister called him and now he is upset. When I tried to explain to Ms. Young that my dear Sister may possibly have an issue of Compassion Fatigue (she’s spent her entire adult life being a devoted caregiver to our late Mother and has also taken care of our Father for long periods of time), Ms. Young cut me off and with great vitriol screamed: “Well I think you have “issues” and I won’t let you speak to your Father; if you try to call him again I will call the police on you and you can’t do anything about it.” Ms. Young then exploded in a rage at me, casting diatribes and aspersions, attacking me both professionally and personally, before hanging up on me. There is zero foundation in truth or reality about anything Ms. Young accused me of. I am very stable, very pleasant, very easy to get along with and have an happy perspective on life. I am very well mannered and do not engage in nor do I accept any abusive or toxic behavior. Ms. Young knows nothing whatsoever about me. Meanwhile I have every reason to believe that Ms. Eicsh is already repeating the unconscionable tactics she used on the late Mr. Al Katz and his family. The lies, the hiding away and isolation of our Fathers, the ridiculous unfounded allegations that as a loving daughter, I am in any way even remotely any threat of harm to my Fathers safety, and the scorched earth tactics such as making blatantly false statements about me, efforts to be divisive and marginalize my Father’s own children, and reports that my Father is in pain, unable to eat, unable to sleep, and this perfectly lucid man has deteriorated very quickly because he is on forced psychotropic medications and other medications that are causing him great harm and making him appear to not be “with it” when this is not at all his natural state. My effort to contact the Clerk of the Court for the monitoring of my Father’s situation resulted in the Deputy Clerk telling me to write this letter. An application and petition to become my Father’s Successor Guardian is being prepared and will be submitted to the Court. I am very deeply concerned that Ms. Eisch, and her associates such as Twila Young have already started an ugly smear campaign and will do everything in their power to discredit me and subvert my efforts to do my sacred job in my family: to be a loving Daughter and Sister no matter what challenge my treasured family members may be facing. Your Honor, I implore you and beg you to not allow any further harm or alienation from his own family to come to my Father. Al Katz was left physically beaten and severely injured under the care of Jonene Eisch. 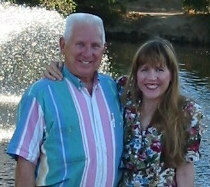 PLEASE, PLEASE do not let them hurt my cherished Father, Dr. Dale Howard Kewitz. I’ll be moving out to Florida to be there for him, but he needs protection until I can first come out there and ensure that he is safe and sound. I love my Father, your Honor. Please help protect him from those who’ve already destroyed the lives of other Wards and their families. I did speak with the Palm Beach County Guardian Monitoring Office and Mr. Anthony Palmieri, but apparently nothing yet is being done to similarly protect the vulnerable Seniors who’ve fallen prey to Abusive Guardians in Manatee County. Please note: I am not presently “Active” with the California Bar, or in any way with the Legal Profession; I’m still recovering from a very severe motor vehicle accident caused by a drunk driver. Dr. Dale Howard Kewitz Sr., Korean War Hero and Veteran, of Bradenton, FL, as he is finally receiving his MEDAL OF HONOR award for his highly distinguished service to the American people and the US Military.